As you advance in your kitchen journey, you’ll eventually run into a bit of a head-scratcher. What do you do when you outgrow entry-level cutlery? Kai tackled this problem head-on, bringing you a series that’s both affordable and high-performance. Kai PRO is a perfect option for aspiring chefs at home and in commercial kitchens. If you’re passionate about food prep, these knives will serve as your companion every step of the way. NSF Certified for use in professional kitchens, Kai PRO cutlery offers a razor-sharp edge, comfortable grip, precision handling—and is built to stand up to the rigors of commercial use. Like all chef’s knives, the Kai PRO 6-in. 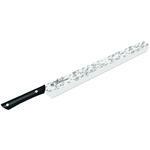 Chef's Knife was made for a wide variety of cutting tasks. 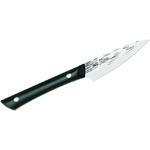 But with its shorter blade, this knife is particularly lightweight and highly maneuverable for slicing, dicing, and chopping. It's ideal for medium-sized fruits, vegetables, and other foods. You can also take advantage of this Kai PRO’s curved belly, which gently “rocks” through fresh herbs or spices to produce a very fine mince. The item is not on our shelf, but we can get it in quickly. 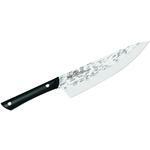 Sometimes we get it the very next day, but typically it will ship out within 7-10 business days..
Hey, I wanted to share "KAI PRO 6 inch Chef's Knife Hammered Blade, Black Polyoxymethylene Handle" with you from KnifeCenter.